What is that relaxed sigh I hear, that peaceful "noise" or lack there of? It is a mini retreat for me here at home. Oldest son is off to Yakama Washington with his youth group to do some mission work, middle child is at camp and baby girl is with Grandma for a few days. Don't get me wrong--as you moms all know--I cherish my children, but a short break every now and then is good for the creative juices, good for the marriage and good for my overall sanity. Wow that's a long, ugly link! Here it is after a good sanding to smooth out the horrible faux finish ! 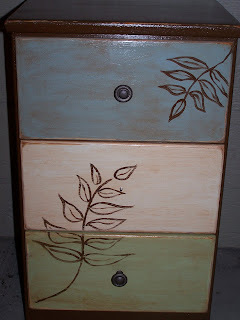 It does have a knob for the middle drawer--it had gotten mucked up so I needed to repaint it. I got this bulletin board/chalkboard at a yard sale for $3. it had the red finish, but it was scratched and chipping. 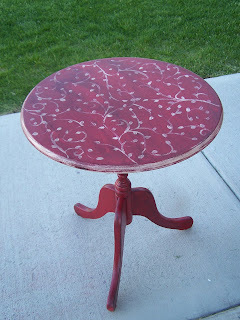 I sanded more of it off, added the leaves/vine and stained it. I also repainted the chalkboard paint as it had some scratches too. 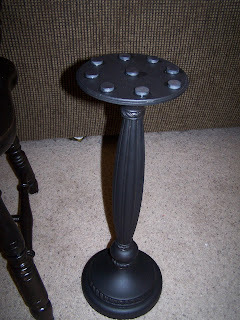 And here is a little, fun side table I made from a lamp base I picked up for free at a yard sale (it was broken). 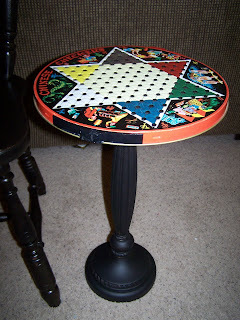 I finished breaking off the top part, glued a round, wooden plaque on the top and then used a great vintage Chinese checkers board I had found. I saw this same board online for $45--I paid $2 for it. It had all of it's original pieces-no one had lost their marbles! But, wait did I make two tables? 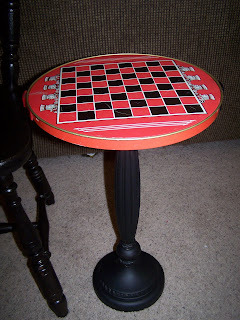 No--I used magnets on the top so that the game can be turned over and either game can be played. 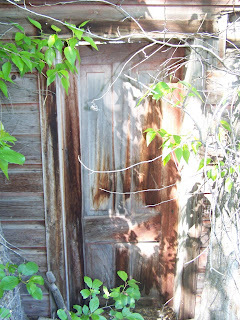 Have a happy Monday--I am off to work on more projects without interruptions Ü! I have been busy this week getting ready for the first Farmer's Market of the year. Our Farmer's Market has a bit of everything--produce, flowers, furniture, paintings, jewelry, etc. This will be my seventh year selling there and I usually do quite well. 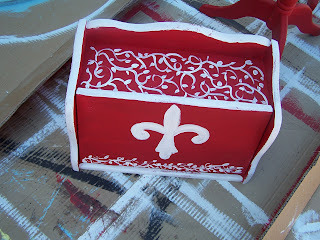 I tend to do more things with decorative painting. 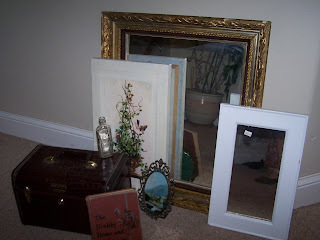 They do not want it to be a flea market or antique show, so I have to really modify pieces and show (or at least attempt to show) some artsy fartsy stuff. Here are a few of the things I have been working on. My style has changed and I am not sure I can paint another rooster (no offense to any rooster lovers out there!). 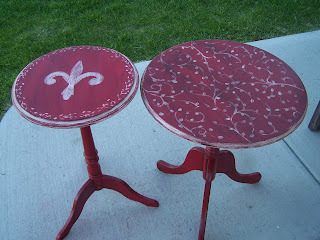 I've tried to do things a little more simple like the red tables I showed in my last post. 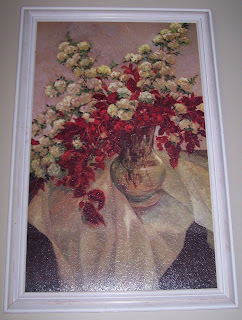 Many of my things are also repurposed or redone without any kind of decorative painting. I had bought some great handmade paper at agarage sale last weekend--5 sheets for a dollar! I put some of it behind the glass in this window and added the hooks. It looks really neat when you hold it up to the light because all of the white parts on the paper are translucent. 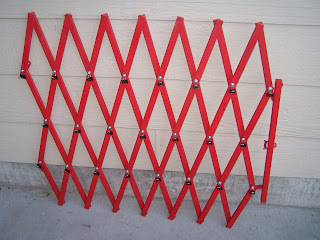 To make a memo or photo board, I added binder clips to this baby gate that I spray painted red. And speaking of spray paint--the new Krylon with the 360 degree spray nozzle is amazing. No drips and it sprayed so nice and evenly. Here are a couple of stools I did. 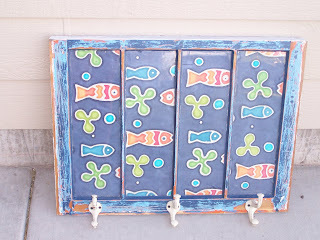 The top one was from Pottery Barn kids and had a scratched wooden top. 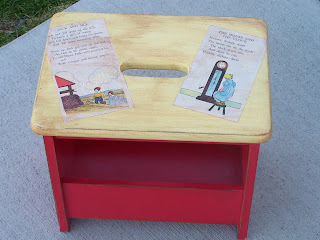 I painted it yellow and decoupaged the two nursery rhymes on there. I used stain over the top. The second stool was shown in my previous post. 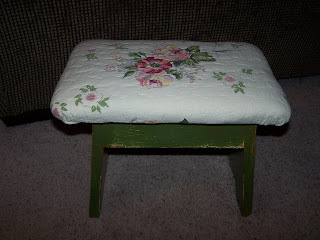 I painted it an added a quilted sham I bought at a thrift store. 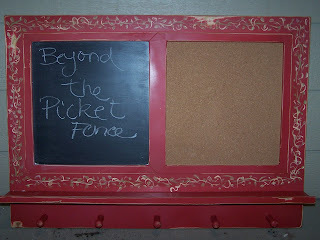 Here is a chalkboard made from an old cupboard door--I have shown lots of these before. I used the candle wax method to get the layers of paint look (click on the picture to see it better). 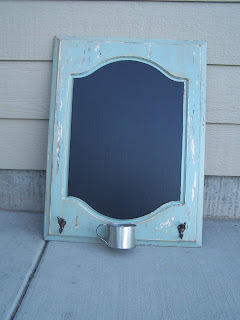 O have a couple other chalkboards I am taking--they always sell well. 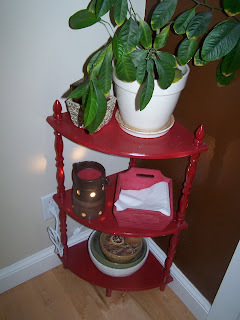 And finally for tonight here is a table I made from this $2 plant stand and a free round piece of plywood I picked up at a garage sale (actually-I got 3 free ones and this is the last one). I wanted something simple so I went with the less than perfect circles. 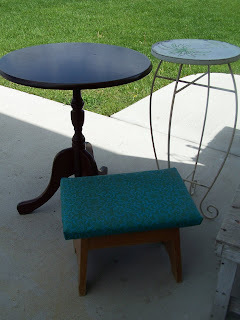 I really want two stools to natch it, but I don't have any in my stash right now. I'll take it as is and if it doesn't sell, I look for some stools or chairs next week. Happy garage saling this weekend for those of you who will be doing that. And if you have a local farmer's market--go out and support it Ü! 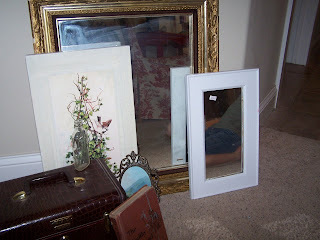 Fun Finds, French Country, and Father's Day! So here are just a few of my fun finds from yesterday and Friday. 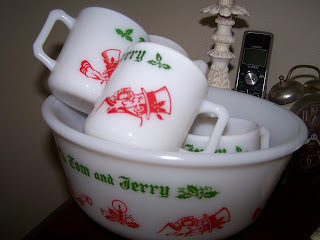 I love this Tom and Jerry set. I will probably put it away until the fall, and then put it in my booth. 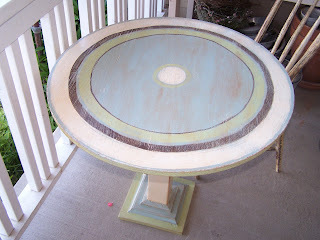 Here is an occasional table--I got two of them this weekend and I will share in a minute what I did with them. 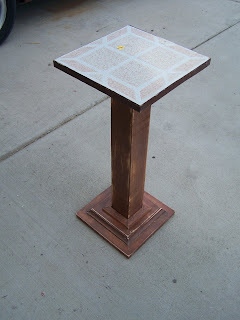 I am working on a mosaic on the top of this poor little plant stand, and I have the stool primed. I need to pick out the fabric for the top before I can finish painting it. I got a lot of other great things too, but I think I will show you those as I use them/change them, etc. 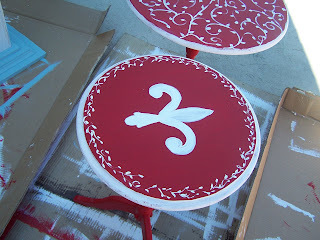 Here are the tables in the process. I wanted you to see how not good they look (i.e. bad) before I sand them and stain them. They pretty much look like a kindergartener painted them. And after. I do need to work on my stain on the top there I can see. 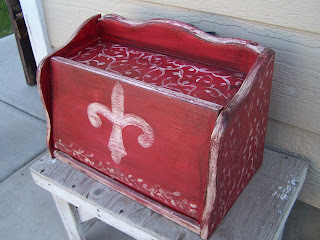 I don't paint the inside of bread boxes because I wouldn't want that smell. 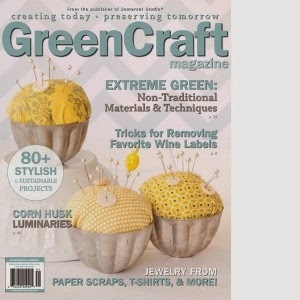 But I think I will decoupage some scrapbook paper on the inside, modge podge seems fairly odorless. And finally--Happy Father's Day (I guess to all the woman who read this? ?--not sure if I have any male readers). We took a picnic to a friend's property. I will leave you with a few sights from there. 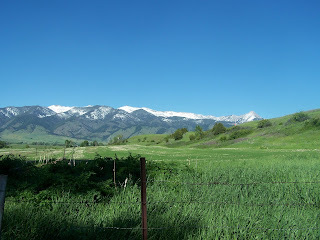 I would love to buy this little acre and build here. It is not for sale though, but it sure is pretty. 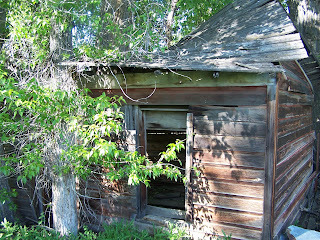 Some homesteaders must have thought so too a hundred plus years ago as you can see from the dilapidated log house. 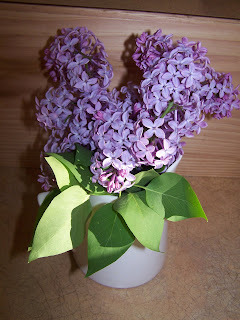 My sweet hubby picked some lilacs for me that were growing wild on the property. 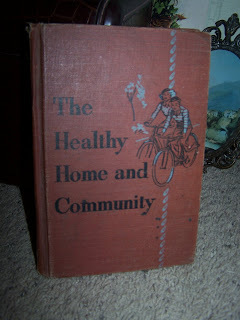 Hey everyone--I hope you like the new look of my neglected blog. I just have not been "projecting" and haven't felt like I had anything to share. We are on day number 12 or so of rain. 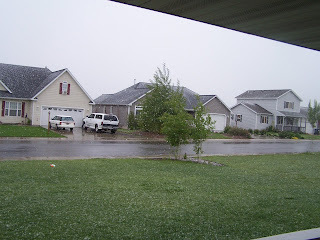 This is what I woke up to yesterday--yes that is snow you see! (If you click on the picture you will see it better.) 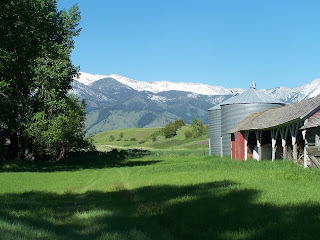 It is supposed to be in the 70's this weekend-I am looking forward to that! This has been a tough week for me--always is. Monday would have been my son's 8th birthday. I think I've mentioned that Mason died of a rare heart defect. He lived only a week--but forever in our hearts. It's a week that always brings back memories and what-ifs and if onlys. We go to the cemetery every year and take flowers. It always amazes me--there are babies who lived only one day and died 30 or more years ago, and there are still fresh flowers on their graves. We were blessed through this tragedy too and have many things to be thankful for. I know that God is good and my son's short life had a purpose and that comforts me. 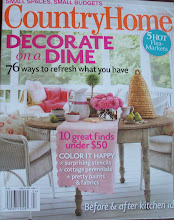 I wish I had a picture to share--but it was before digital and my scanner is on the fritz. Hey everyone (is there an everyone who reads this or an anyone?? ), yes I am still here. I don't know about ya'll but the last two weeks of May/first week of June are like December for me. There are field days, and track meets, awards assemblies, soccer games and make-up soccer games, preschool graduation, high school graduation and parties. Don't get me wrong--I have enjoyed all of these events (except the soccer in 40 degrees weather), but whew, I have hardly been home at all. And when I have, it has not been about junking. 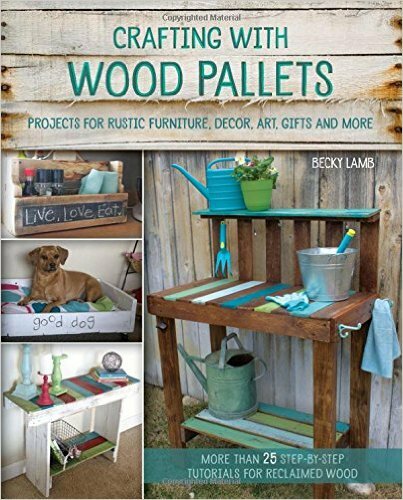 I got a few projects in the works that I will attempt to finish this week, if it ever stops raining! 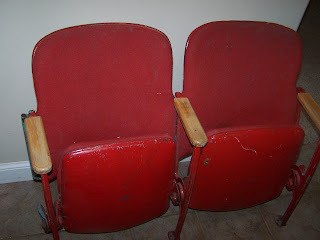 I got these red theater seats at a garage sale last Saturday. I need to clean them up and then they are going to my booth. Here is a cheap ol' picture from Ross. I love it though, except I think I want to paint the frame black. What do you think? Here is a little shelf that sits in my kitchen. 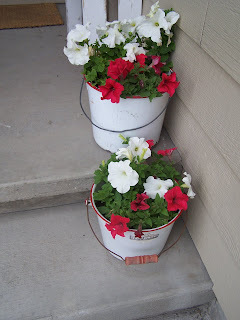 It was one of those shaky white ones--I spray painted it red. Nothing too exciting--it holds my napkins and my scentsy burner. 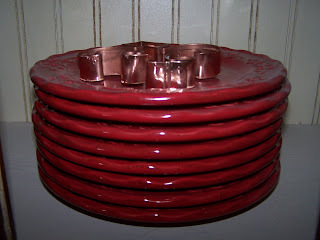 A stack of red Christmas dishes that i leave out all year long! A (DIRTY!) 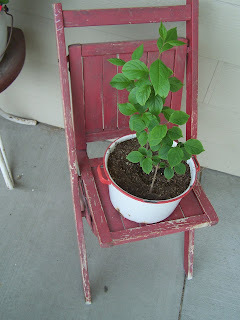 red chair that sits on my front porch--this is from my MIL. 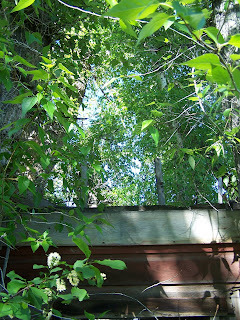 Those are Japanese lilac bushes in the pot. 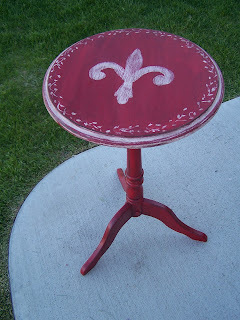 And this dirty old red stool. It was at my grandma's by her fire pit. We would sit on them we had weenie roasts. My grandma loved a good weenie roast! 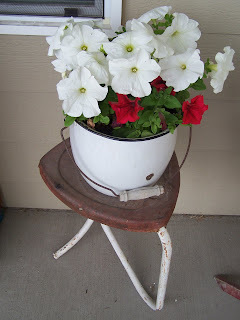 A few petunias in old enamel pots. 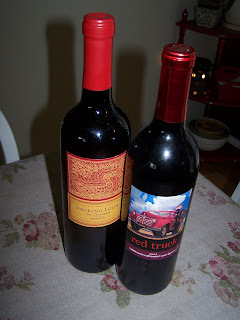 And finally a few bottles of inexpensive red wine that I like. The Smoking Loon you can get at Costco for less than $10. Look for the red in your life and let it energize and inspire you!